Mechanically stabilized earth (MSE) walls have replaced traditional concrete retaining walls over the last 20 years providing a way to create earth retaining walls. Mechanically stabilized earth walls have plenty of advantages when compared to conventional reinforced concrete walls mostly because they are installed easily and because of the time it takes to assemble these walls. These walls consist of granular soil used as backfill, reinforcing mesh or strips, and a precast concrete block that will be assembled on top of each other forming an interlocking gravity earth retaining wall. MSE walls can be used to create high, curved or shaped walls that are ideal when a lot of utilities are in the area and there is no option to bring heavy equipment to the area. On areas of high seismic activity. The use of heavy equipment is reduced. More land is available for construction. Faster construction than traditional concrete walls. Do not require specialized labor. Reduces the need for wall finishing. Less site prep is needed. Can be built in confined areas or areas where a concrete wall is almost impossible to be constructed. Reduces the need for the land acquisition process. Mechanically Stabilized Earth walls are susceptible to elastic deformation. MSE walls can be used as tall structures, exceeding more than 60 feet of wall height. Can be combined with other products. Various shapes and forms can be made. Excavation works for footings are reduced. Can be built in poor soil areas. Segmental precast concrete panels: Precast panels in the form of square, rectangle, diamond or hexagon, connected with shear pins. Modular block wall: Solid or with cores filled with aggregates during their installation. Usually name Keystone®, Versa-Lok®, etc. Metallic Facings: lighter facing finished, made of galvanized steel split into half cylinders. Gabion Facing: can be connected to the wall systems. 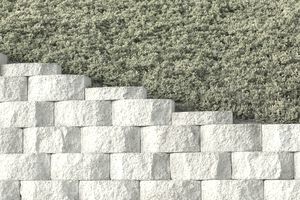 Geosynthetic Facing: Geotextile reinforcement, forming the face of the retaining wall. They can be exposed to vandalism, weather inclemency and other types of surfacing problems. Post-construction Facing: Shot Crete, cast-in-place, spray on, plastering or other techniques can also be used as a compliment facing for the mechanically stabilized earth wall facing. It adds some cost to the construction but will provide an aesthetic finish surface for the MSE walls.